The EFC Virtual Library, powered by IssueLab, includes over 900 free-to-download publications from a range of organisations and publishers, including the EFC, on the topics of philanthropy, the management of foundations and the areas they are involved in and support. As an EFC member you can send us your publications for inclusion in the library which will also be added to the global IssueLab network where they will be made available to an extended audience, including users of Worldcat, the global catalogue used by tens of thousands of libraries. For questions or assistance, please contact the EFC Virtual Library. This report is the most comprehensive study to date into support for environmental initiatives provided by European philanthropic foundations. It builds on the three earlier editions, increasing the number of foundations and grants being analysed, along with the total value of these grants. 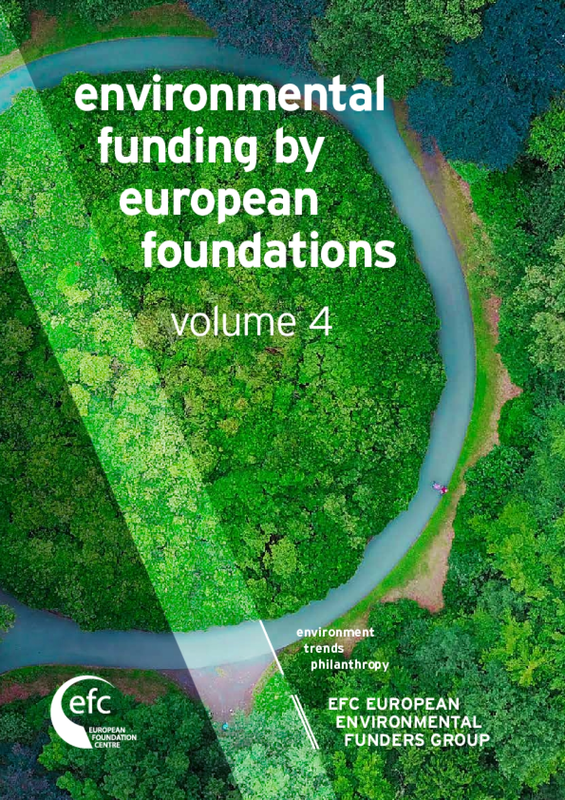 This 4th edition features a detailed analysis of the environmental grants of 87 European public-benefit foundations, as compared to 75 in the previous edition. These 87 foundations include many of Europe's largest providers of philanthropic grants for environmental initiatives. "Thinking beyond national borders – Research and funding across boundaries" highlights some of the key takeaways from the 2018 EFC Research Forum conference, hosted by the VolkswagenStiftung in Hanover, Germany. The event looked at how philanthropic organisations can overcome such boundaries and what they have to gain in doing so. The conference explored the following questions through workshops, panel discussions and keynote addresses: In what ways is international collaboration in research important? What can we learn from philanthropic organisations that have long experience of international grantmaking? What is the future of science policy in Europe, what institutional tools are needed, and how can science diplomacy help us? This report covers the main themes arising from the conference from the perspectives of researchers, funders and institutions. 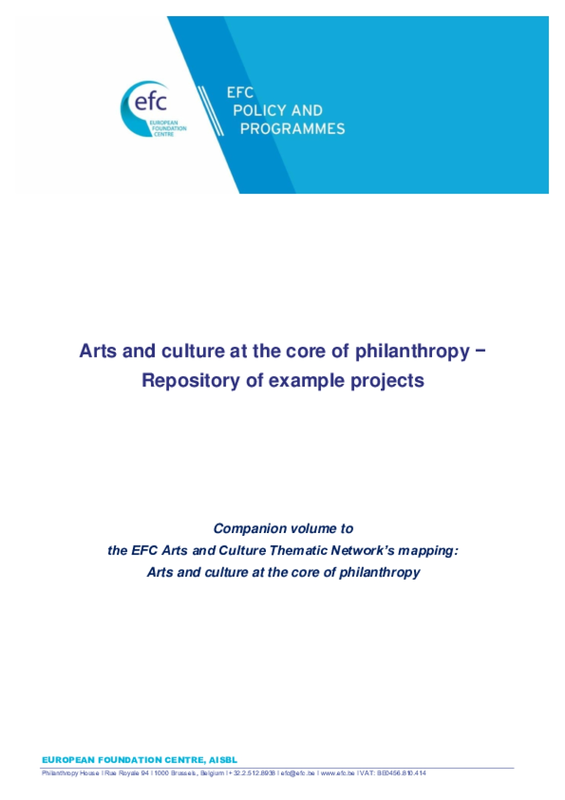 The field of arts and culture is at the core of philanthropy, and is among the most important areas of funding for philanthropic organisations in Europe. This mapping, produced by the EFC's Arts and Culture Thematic Network, sheds light on how activities carried out by the organisations engaged in this field are diverse in both themes and approaches, covering different sub-areas and with a clear interest in multidisciplinary arts and crosscutting areas and issues. 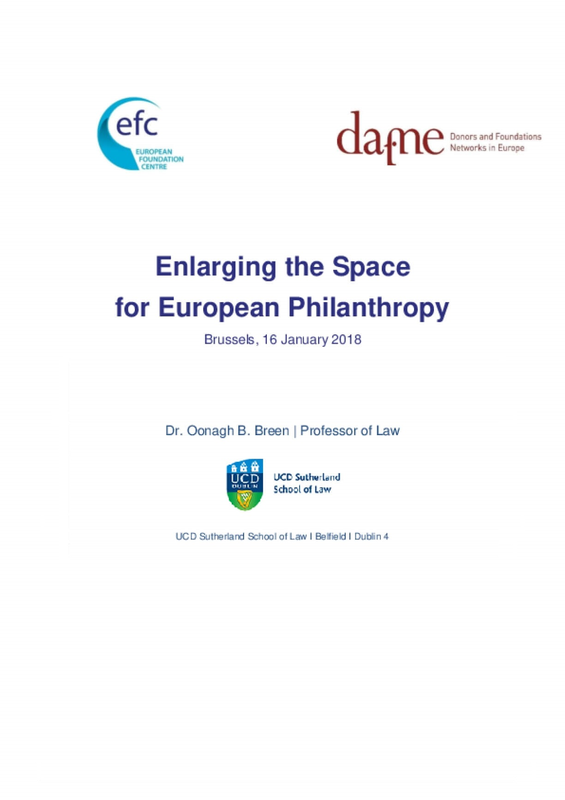 The EFC and DAFNE will use the learnings of this study to kick-off joint advocacy work for Europe's philanthropic sector with the aim to maintain and develop the space for philanthropy across Europe and its positive impact on civil society. The study stresses key dilemmas and solutions Philanthropy remains largely outside the European treaties. Its recognition in the treaties and in European fundamental rights is needed. 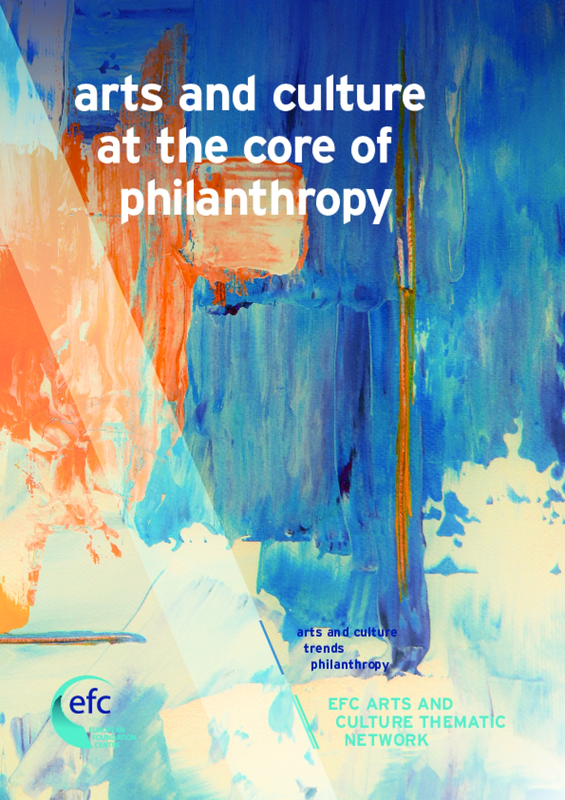 Barriers to cross-border philanthropy pose a major challenge. While the freedom of capital movement prohibits foreign funding restrictions, Europe needs to move towards a European public benefit concept, non-discriminatory tax regimes and simplifying tax authority practices and providing for more information sharing tools. National laws must be in line with European fundamental rights and EU freedoms. While the philanthropic sector uses existing protection mechanisms (e.g., via EU Treaty infringement procedures) it may be necessary to examine if these are sufficient. EU and national efforts to counter-terrorism financing, money laundering and tax evasion, which are intended to protect the sector must be risk-based, proportionate and evidence-based. In addition, the sector and policymakers should work jointly to assess and address risks. 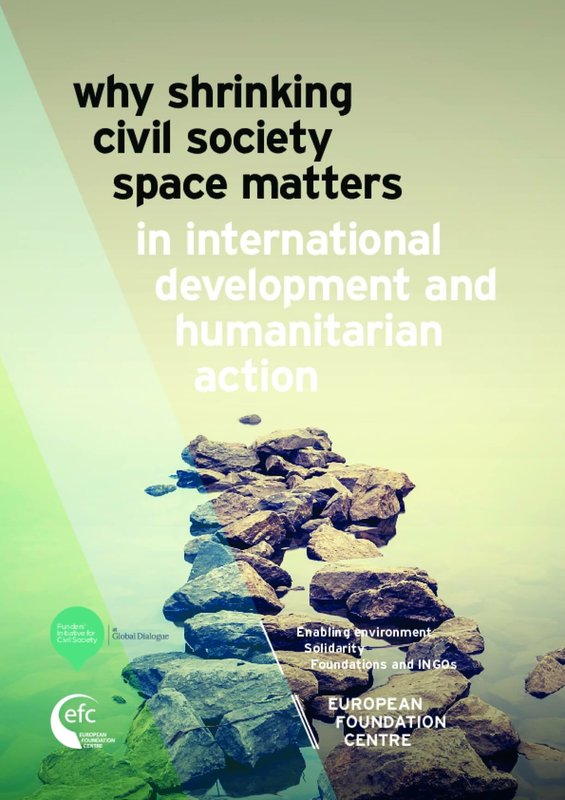 Closing civil society space is a growing trend, impacting civic actors in countries throughout the world. This paper examines how the trend effects development funders and actors, and how they are responding. Questions explored include: what are funders doing to engage around re-opening space for civil society? How are they adapting? What are the impacts of the development community's approach to civil society as a whole? The European Foundation Centre and the Funders' Initiative for Civil Society have come together to develop better insight into these questions and to increase awareness of the threats to civil society. 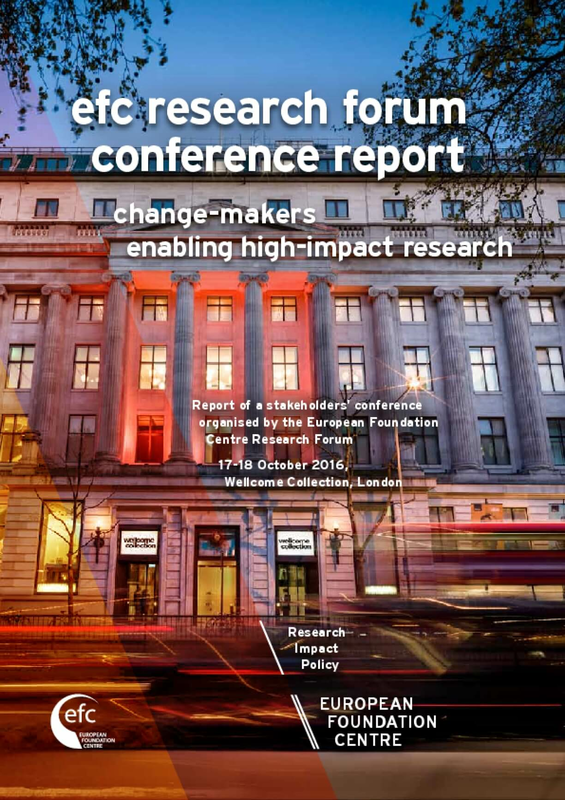 "Change-makers – enabling high-impact research" highlights some of the key takeaways from the 2016 Research Forum conference, hosted by the Wellcome Trust in London. These include contributions from Peter Piot, the Director of the London School of Hygiene and Tropical Medicine, on learning lessons from epidemics; Ulrike Felt, Professor of Science and Technology Studies at the University of Vienna, on striking a balance between curiosity-driven research and research that has a clear impact on the public; as well as diverse case-studies from other foundations. In the context of the 10th anniversary of the United Nations Convention on the Rights of Persons with Disabilities (UNCRPD), the European Foundation Centre undertook a survey of its members and other institutional philanthropy actors who are funding, supporting, advocating, and partnering to advance the situation of people with disabilities in Europe and beyond, including those with disabilities related to ageing. 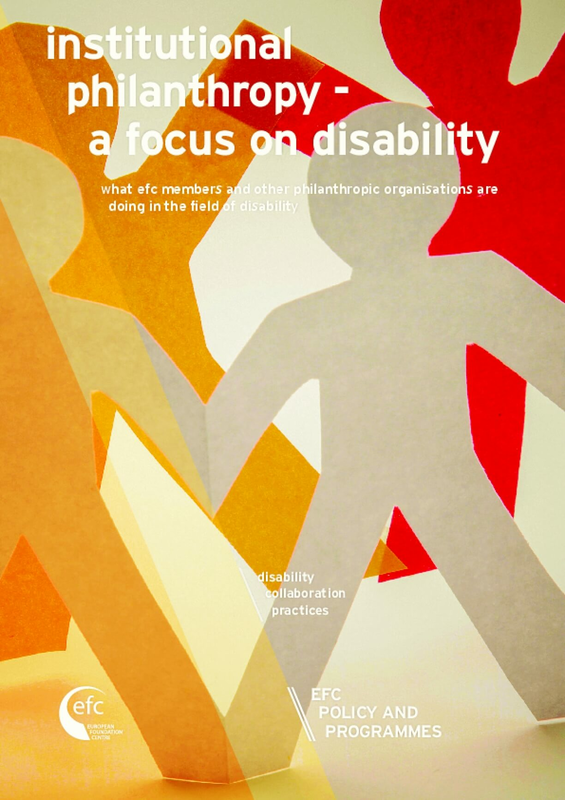 This publication summarises the survey results which provide an up-to-date picture of EFC members and other funders active in the field of disability, whether it is part of their core mission or just one of their fields of action, and an insight to better understand their practices. The survey results are based on input from 34 philanthropic organisations. Data supplied refers to the year 2015 unless otherwise specified. The report comprises two parts: Part 1: A profile of this sample of disability funders, addressing in particular who they are, their main area(s) of focus, who they support, how they work, and if they cooperate and why. Part 2: A snapshot of 24 initiatives and projects supported by these organisations to illustrate some of their disability-related work, outlining their approach and achievements, as well as some challenges and learnings. This publication was produced with the support of the EFC's Disability Thematic Network (DTN). Network members include: King Baudouin Foundation, Essl Foundation, Fundacion Once, Fondazione Bianca del Monte di Lucca, Genio, Karuna Foundation, Light for the world, and Sabanci Vakfi. The EFC Virtual Library, powered by IssueLab, includes over 700 free-to-download publications from a range of organisations and publishers, including the EFC, on the topics of philanthropy, the management of foundations and the areas they are involved in and support. As an EFC member you can send us your publications for inclusion in the library which will also be added to the global IssueLab network where they will be made available to an extended audience, including users of Worldcat, the global catalogue used by tens of thousands of libraries. For questions or assistance, please contact the EFC Virtual Library.